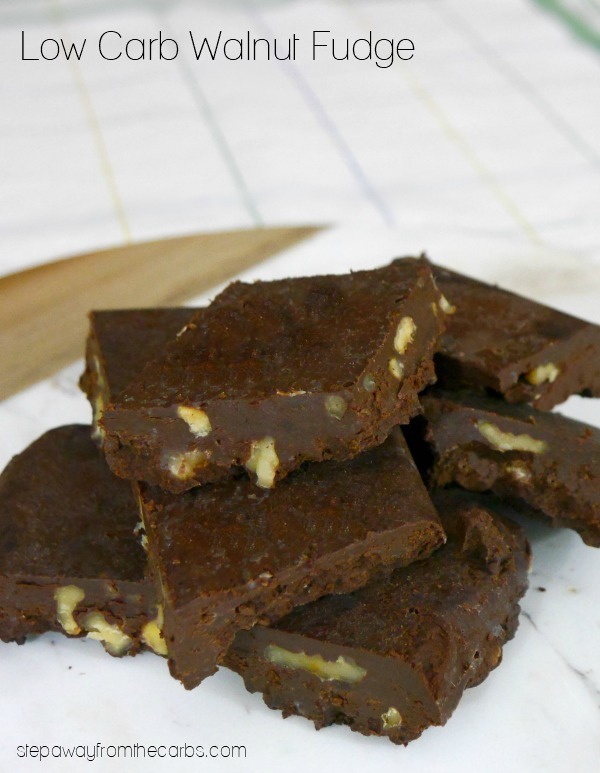 This low carb walnut fudge is perfect for when you want a rich and chocolatey treat! Sugar free and keto recipe. 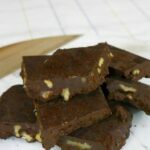 This recipe is loosely based on my low carb chocolate fudge recipe, but I have amended it in a few ways including changing the amount of coconut oil and (of course) added in some toasted walnuts for a wonderful texture! 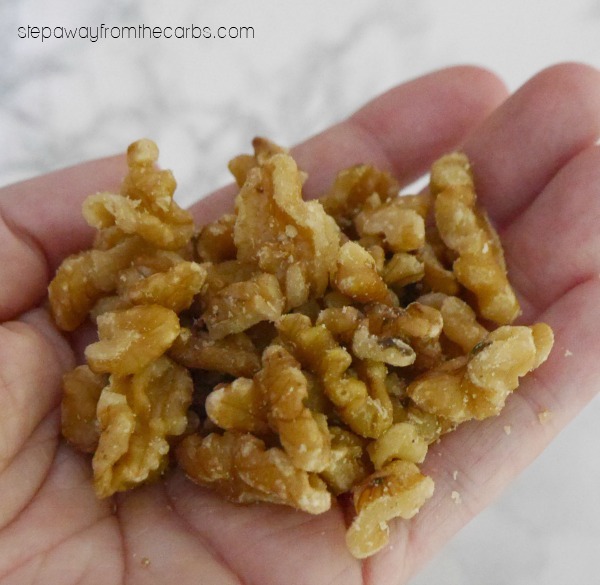 Walnuts are a good source of omega-3, iron, selenium, calcium, zinc, and vitamin E. There have also been studies that show that walnuts may reduce the risk of cardiovascular disease and can improve cholesterol levels. They are also perfect for a tasty low carb snack! Prepare an 8×8″ baking pan by lining it with baking parchment or a silicone mat. To toast the walnuts, heat a small skillet over a medium heat. Add the chopped walnuts to the dry pan, and cook for about five minutes, stirring frequently. Set aside. Add unsweetened almond milk, heavy cream, coconut oil, and low carb sweetener (eg granular Swerve or xylitol) to a saucepan and heat over a low heat. Stir until the sweeteners have dissolved and the mixture is fully combined. Break unsweetened chocolate into squares and add them to the milk mixture. Continue to cook, stirring regularly, until the chocolate has melted and has been incorporated into the liquid. Add in the walnuts, then pour the mixture into the prepared baking pan. Leave to cool, then transfer the pan to the fridge. When the fudge has set, turn it out onto a chopping board and cut into 16 squares. I’ve given nutritional data per square as this low carb walnut fudge is super rich! Whenever you feel the need for a chocolatey boost, reach for a square of this! 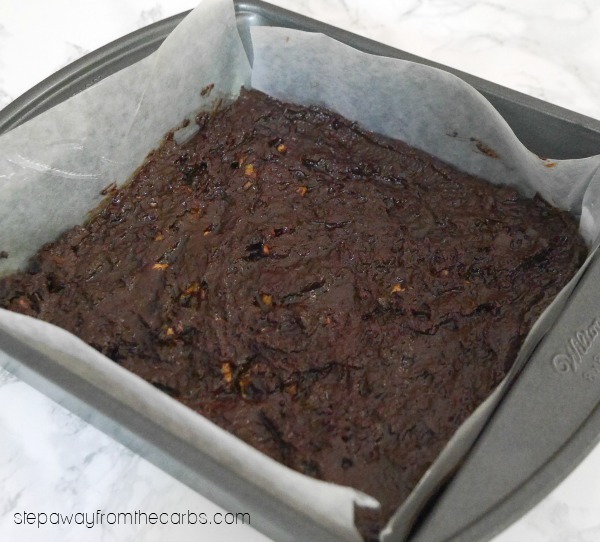 Prepare an 8x8" baking pan by lining it with baking parchment or a silicone mat. Add unsweetened almond milk, heavy cream, coconut oil, and sweetener to a saucepan and heat over a low heat. Stir until the sweetener has dissolved and the mixture is fully combined. Can I substitute the almond milk with raw cows milk or coconut milk? I’ve never tried it with either, I’m afraid as I’m not much of a fan. But I can’t see why not – so it you try it, please let me know how it goes!